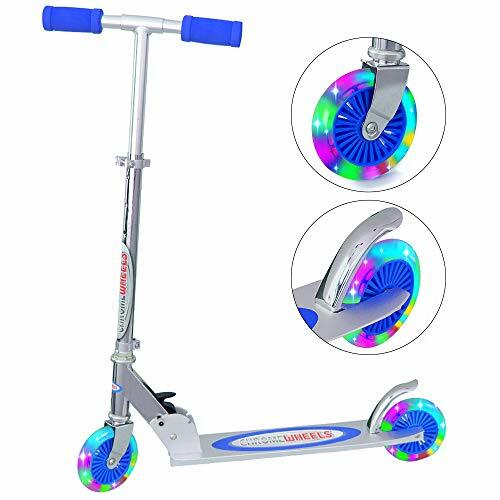 This ChromeWheels 2 Wheel Kick Scooter is design for beginner children aged 5-12, our scooter constructed of high quality aluminum alloy frame and durable components provide your kids glide safely, stably and smoothly, let your child go out and have fun with others, practice outdoor sports from childhood. ChromeWheels Kick Scooter is your best choice! √ 2-Wheel Freestyle design with high durable PU wheels and ABEC-7 bearings provide a smooth ride. √ LED flashing light wheels add more fun while riding. √ 4 adjustable T-bar height accommodates children as they grow. √ Easy fold & carry design, simply 3 steps within 1 minute. √ High quality aluminum alloy frame, built to last for years of enjoyment. √ Strong anti slip deck with built-in suspension for a safe and stable ride. √ Rear wheel brake for safe and speedy stopping. √ Detachable & Adjustable Shoulder Strap for easy carry. √ Detachable handlebar & Foldable steel frame for easy travel and storage. --Check the wheels periodically to ensure that they aren't loose before riding. --Do not riding on wet or uneven surface. For best protection, we recommend that children wear helmets and knee elbow pads when riding. ADJUSTABLE HANDLEBAR HEIGHT: Our Kick Scooter with adjustable height aluminum alloy handlebar can be adjusted from 25.6 to 34.5 inches, with a max weight of 132lbs, great for 5-12 years children. INTELLIGENT TURNING AND EASY TO STOP: You can control the turning and balance easily by your physical incline. This Kids Scooters features an easy to access rear brake for safe and speedy secure stop. DURABLE ALUMINUM FRAME: Our Child's Scooter is made with high quality aluminum alloy frame and durable components, built to last for years of enjoyment. Handles with comfort grip pads and low anti slip deck for secure and easy scooting. EASY FOLD DESIGN: This Kids Scooter is easy to fold with simple 3 steps within 1 minute, come with Detachable & Adjustable Shoulder Strap for easy carry, you can carry it wherever you go and is ideal for travel or storage. PU LUMINOUS WHEELS: Quality Flashing wheels which contain magnetic steel will brighten with the increase of rolling speed. Wheels are built in ABEC-7 bearings give this scooter more smooth, speed glide and fun ride. Perfect gift for your little ones, let your kids enjoy the endless fun of this kick scooter now! If you have any questions about this product by ChromeWheels, contact us by completing and submitting the form below. If you are looking for a specif part number, please include it with your message.